Earlier this year, BlackBerry CEO John Chen referred to Apple iPhone users as "wallhuggers" because of their propensity to hangout near wall outlets so that they can charge up their phones. A little more than four months later, Samsung released a commercial that showed Apple iPhone users surrounding the outlets inside a convention center. Even the bathroom outlets are fair game for iOS users, according to the ad. Now, Apple iPhone users can make their wall hugging days a thing of the past, thanks to the PWR case. Just snap both parts of the case together, and you've got power. 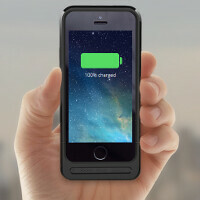 The $99.95 version of the case comes with a 1500mAh battery, which will bring your iPhone back from flatline to 80%. Pay just $20 more for a version of the case with a 1900mAh battery, and you can bring your iPhone all the way back to life. There is a PWR case designed for the Apple iPhone 5 and Apple iPhone 5s, and another model made for the Apple iPhone 4 and Apple iPhone 4s. With the slide out prongs, you can make sure the rechargeable cell is 100% ready to go by sticking it in any outlet. And you can also use the prongs to charge up your phone just in case your power needs are extreme. The PWR case is available in black or in three color combinations. If you are looking to break your addiction to wall outlets, the PWR case can really help! Just get a 6, or 6 plus and problem solved. Great battery life, great performance, great phone. Loving my 6 plus. Why would you buy something with old technology that apple calls "new"...? How stupid? You're not a idiot are you? Super nice phone bro. Still at 22% after taking it off the charger yesterday at 4am. In Vegas it's 3:42am as I type this. Excellent battery life. The word you're looking for is inexplicably. And you're wrong. It's actually very easily explained. If you were selling a product to the public & people were willing to pay top dollar for it, why would you sell it for less? Judging by the way it's selling, Apple priced it just fine. A business isn't a charity. Yeah? Here in my country, IPhone 6 16 Gb costs as much as 150% the price of a 32 Gb G3 and twice as much as Xperia Z2 and I really can't see why Faster? May be true but not 50% or 100% faster Cameras? You couldn't be any more wrong, good hands can do marvellous with IPhone but do Excellently with Z2 or G3 Battery? Not better Sound? Not twice as good, Barely equal Design? Beauty is in the eye of the beholder What else ? Your comment doesn't really get to the point. Value isn't measured by any of the metrics you mentioned. It's completely subjective & that's exactly why the iPhone sells more than the devices you named combined. No its not hard to understand" Because: It must be a mixture of several elements, ranging from collective contempt (they call Apple users "Apple fanbois" or "fantards" or "Steve Job's sheep") to actual social resentment (the idea that iDevices are expensive and therefore their users are of a higher social class). So they have this imperative "mission" to let everybody know that they were the smartest, they didn't fall for the fad, they waited and got what they consider "la creme de la creme", as compared to the competition brand users, the "Apple fantards". Because in their narrow minds the only reason why Apple has been able to sell over 400 million devices so far is because we have ALL been fooled; for them, there isn't one slight remote chance or possibility that our choices were rational and based on the actual quality of the product. In the end, it's just an indirect way to reassure themselves that they didn't make the wrong choice by getting the wrong device. Mannnn shut up with that crap. You made more sense, when you posted as Arte 8800...not. When you have a minimum wage job at McDonald's, even that Tercel is out of reach. Well Said! Proud Owner of Xperia ZR..The Best Smartphone You can Get! No one cares. People have their devices, and just use them. Do the same. Is the battery life on the 6 that good? My wife had the 5 and the battery life was terrible. The only iphone that gives me decent battery life is the iphone 6 plus, I had to switch from the 6 for that reason alone, even though I love the 6's size and in hand feeling. Gotten used to the 6 plus size now. Great idea, if someone likes 4" phone he should change to 5.9" and it will solve his problem. I have better idea, get iPad Air, mine lasts 5 days of usage. Yes they do, if you owned one you'd know that. It doesnt, if you owned one you'd know that.